A week before Prime Minister Netanyahu's March 3 campaign speech to the U.S. Congress, Secretary of State John Kerry warned the Congress that the Israeli leader was up to his old tricks. Not only did the Israeli leader shamefully interfere in delicate U.S. foreign negotiations, he also inspired an embarrassing ill-informed letter from 47 senators to "Iranian leaders," designed to undermine President Obama's negotiations with Iran. 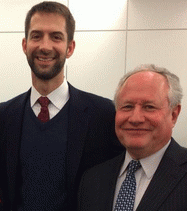 With the encouragement of AIPAC, the letter was circulated by newly-elected Arkansas Senator Tom Cotton, shown above on the left standing with Bill Kristol, an important figure in the neocon drive to support President Bush's 2003 invasion of Iraq, now considered one of the nation's major foreign policy disasters. Unfazed by the Iraqi debacle, Kristol remains a zealot for U.S. militarism. He now has a new protege with whom he can swing his weight around the halls of Congress. With a massive financial push from Kristol late in the 2014 campaign, Cotton won an upset victory over Arkansas' Democratic incumbent Senator Mark Pryor. Over the previous decade, Cotton and Kristol developed a bond derived from a common brand of conservatism and a desire to remake Washington in the neocon image. Kristol raised close to one million dollars to help then-representative Cotton defeat Pryor. Kristol's successful funding effort also guaranteed that Cotton would have the support of the four biggest funders of major anti-Iran organizations. "In the past four years, Sheldon and Miriam Adelson have emerged as the preeminent funders of the Republican Party through a network of super PACs and nonprofit groups. At the same time, they have been among the biggest funders of groups that oppose any deal with Iran over that country's nuclear program. "Along with Adelson, there are three other donors who fund both anti-Iran groups and the Republican Party's super PAC infrastructure: hedge fund directors Paul Singer and Seth Klarman, and Home Depot founder Bernard Marcus. "These four right-wing, pro-Israel donors gave a combined $11.5 million to some of the biggest opponents of the Iran negotiations from 2011 through 2013, and pumped $115 million into Republican Party super PACs in the 2012 and 2014 elections.of major anti-Iran organizations." Newly-elected Senator Cotton and neocon leader Bill Kristol are now doing the work of AIPAC, and their pro-Israel, anti-Iran funders, standing with a foreign leader on a foreign policy issue against their own president. In the process they have pulled 47 Republican senators into their scheme. Some of those senators are expressing doubt over their decision to sign a letter they had quickly read and endorsed. Arizona Republican Senator John McCain, once a highly respected foreign policy-oriented senator, actually pointed to the approaching snow storm as an excuse to move so quickly on a matter of such importance.
" If you take out Saddam's regime, I guarantee you that it will have enormous positive reverberations on the region. ...The task and the great opportunity and challenge is not merely to effect the ouster of the regime, but also to transform the region." John Kerry's response to that disastrously wrong assertion, "we all know what happened with that decision." "Kerry's criticism links Netanyahu implicitly with the neoconservatives who pushed the war to transform the Middle East, and makes all but explicit the idea that the neocons pushed the war out of concern for Israel's security." In this CSPAN video clip, Netanyahu's 2002 testimony before the House Committee sounds ominously like the speech he delivered to Congress earlier this month. In this video, the man sitting behind Netanyahu, visible over the Prime Minister's left shoulder, appears to be a younger Ron Dermer, a former Republican operative from Florida. Dermer, currently Israel's ambassador to the U.S., gave up his U.S. citizenship in order to enter government service in Israel. His latest political coup was to arrange Netanyahu's speech to Congress through Republican Speaker John Boehner. 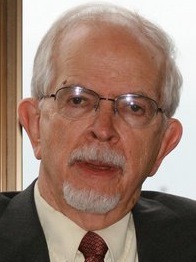 "The views that Cotton and the other Republicans have espoused on Iran were the product of assiduous lobbying by Israeli agents of influence using the inducement of promises of election funding and the threat of support for the members' opponents in future elections. "Those members of Congress don't arrive at their positions on issues related to Iran through discussion and debate among themselves. They are given their marching orders by AIPAC lobbyists, and time after time, they sign the letters and vote for legislation or resolution that they are given." Former AIPAC lobbyist M.J. Rosenberg has concluded "Nothing happens on Capitol Hill related to Israel, unless and until Howard Kohr (AIPAC chief) wants it to happen. Nothing." Tuesday, March 17, Israeli voters will render their verdict on the leadership of Benjamin Netanyahu. Under Israel's election system, the jury will remain out until the competing parties agree on the next Prime Minister. Likud and Zionist Union will then bargain with smaller parties to determine which political coalition will select the next prime minister. It could be Netanyahu again, even if he runs second in the final results. If the Herzog-Livni coalition is successful, they have already announced that they will rotate the office of Prime Minister. Whatever the final outcome, AIPAC will be standing by, awaiting its marching orders.